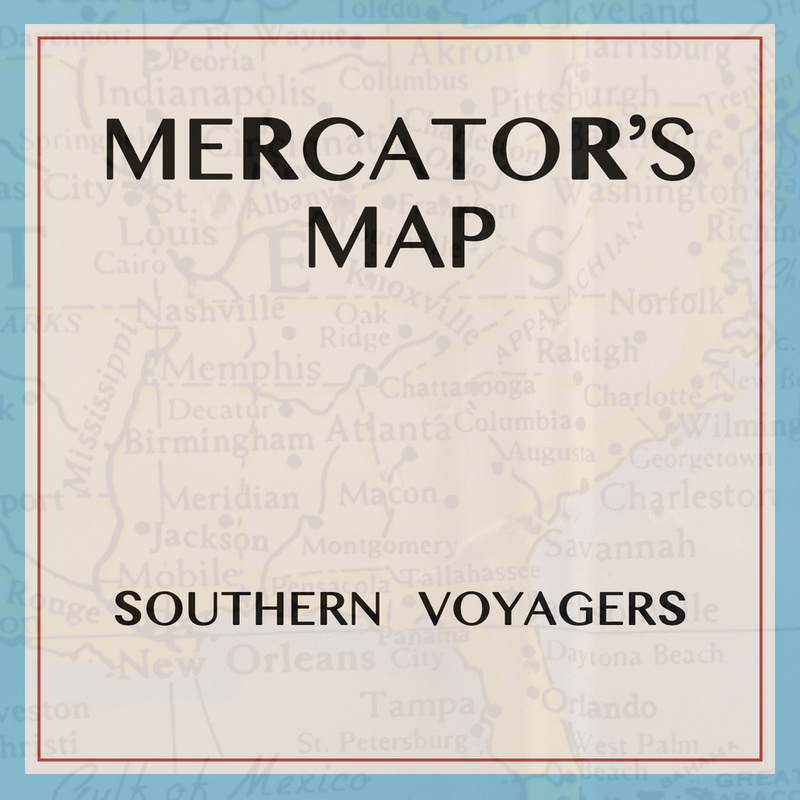 Review: Southern Voyagers - Mercator's Map | B.G.M. Confession: I’ve never been a huge fan of post-rock. I find it to be stuffy and pretentious while, ironically, its artists make no affecting statement with their bloated, meandering compositions, and crescendos that lead nowhere. I understand the reactionary mindset that spawned the genre, but with the amount of oversaturation, post-rock has, for many, it has become little more than background music for the mundanity of everyday life (Because, hey, with no vocals, why bother really listening to it?). I approached Southern Voyagers’ debut EP Mercator’s Map with some trepidation considering my ingrained bias toward the post-rock genre. Hailing from the same Bluegrass State as yours truly, Southern Voyagers is a project that is headed anonymously; there is no information about band members, and the debut EP seemingly appeared out of nowhere on Bandcamp. While the tropes of post-rock are here, Southern Voyagers trim the excess and meandering that makes the genre such a snoozefest for this reviewer. Clocking in at just under 15 minutes with four songs, Mercator’s Map feels less like a full release and more as a demonstration of the project’s capabilities, providing a concise, digestible listen that leaves listeners wanting just a little more. The EP opens with “Good Hope,” a track centered around shimmering guitar arpeggios, layers of intricate, intimate melodies, and gently rolling drums. I’m immediately reminded of Thrice’s work from the second volume of The Alchemy Index, and the watery imagery of that album seems to fit the ebb and flow of the music here very naturally. The opener, in its three and a half minutes, manages to really go somewhere; after a brief chordal change, the band launches into a crescendo that, while the high point, still shows some restraint. Just like that, though, a final lead guitar decays into the background, and the song is over. “Norfolk Island” starts out similarly to the opener, but rather than actually hitting a climax, the song abruptly cuts off in the middle of the build as guitars distort into static and drums pound away. We as listeners obviously look for the tension to be released, but it doesn’t happen in this track. While a smart move in terms of songwriting, “Norfolk Island” is only three minutes long and feels underdeveloped. On the flipside, “Athabasca Island” is by far the most accomplished piece, with a busy drum beat and serene piano figures driving the song as guitars harmonize and stack against each other with counter-melodies adding a playful touch. Things slow down halfway through before the most fulfilling climax of the entire EP arrives and stays around just long enough to wrap listeners in arms of beauty and peace before ending. “Red River Gorge” closes the EP with a nearly waltzy feel, and while the guitars layer beautifully, the foundation of the song isn’t as compelling as some of the former tracks. Mercator’s Map, for all of its brevity, shows great taste and tact in songwriting. Guitars are layered in such a way that new elements are being introduced on top of previous melodies, and for the most part, the changes in tempo and pacing are well-executed to keep listeners engaged. The production is a bit rough around the edges, with some of the guitars sounding a bit sharp and the drums sounding very “garage-y”; this, however, was one of my favorite aspects of the EP, since most post-rock is mercilessly polished to a point of being sterile and pristine. For fans of post-rock, Mercator’s Map will satisfy your appetite for post-rock that is upbeat yet tranquil and peaceful. There is clear growing room for Southern Voyagers, but this EP is an excellent starting point with a real sense of identity.